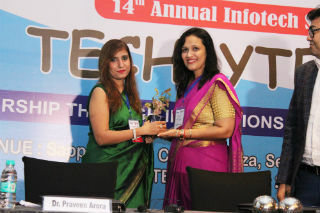 Jagan Institute of Management Studies, Rohini campus organized its Annual IT Symposium, TechBYTE 2017 on 14th October, 2017 at Sapphire Hall - Crowne Plaza, Rohini, Delhi. 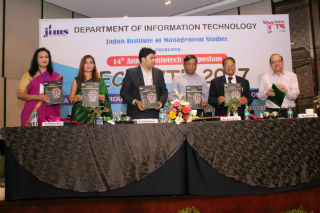 Faculties from other GGSIP university affiliated colleges attended this symposium along with JIMS IT faculties and MCA students. 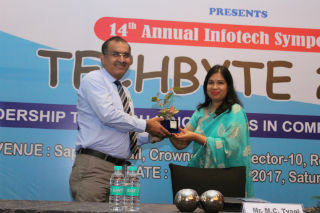 The Department of Information Technology organized this event with entire zeal and zest and made it a grand success. 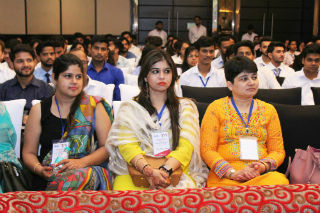 Renowned personalities from IT industry graced the event with their presence. 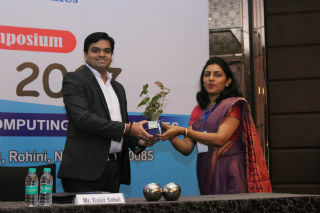 The Chief Guest and guest of honor of the day was Mr. Amit Arora, Partner, Foresight Gr. International, and Mr. Rajesh Kumar, Chief consultant & Founder, Alleviate IT consultancy respectively. 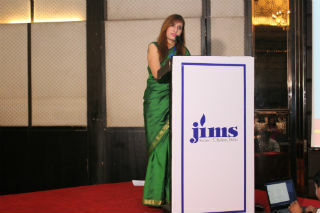 Ms. Ankita Chopra did Ice-breaking ceremony and introduced JIMS and IT department to the audience. 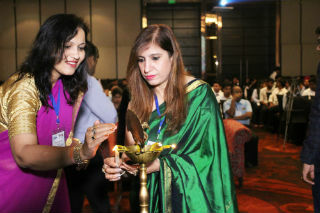 The symposium began with lightening of Lamp and remembering the goddess of knowledge, Maa Saraswati through Saraswati Vandana in the presence of Dr. J.K.Goyal, Dr. Parveen Arora and venerated guests. 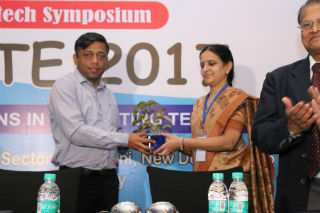 Dr. Praveen Arora, HOD-IPU programs welcomed the Chief Guest, Guest of honor, faculties and students to the symposium on behalf of JIMS fraternity and delivered welcome address. She highlighted the need of innovations in security features in latest technological initiatives. She emphasized on the need to learn and innovate through efforts. 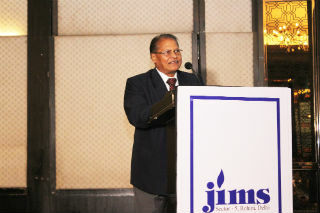 Prof. (Dr.) J.K. Goyal, Director JIMS motivated the faculty and students with his enlightening speech. He spoke about the key topic of the symposium “Leadership through innovation “. He discussed how innovation is the key to success in the corporate world. He also discussed how innovation is especially important in IT sector because there is a continuing growth happening in this sector and only those who can bring about innovations are going to be successful. His address was applauded by the audience. 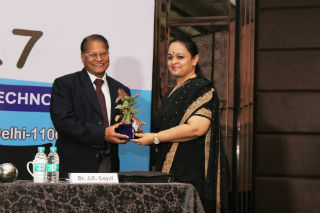 The session was then presided over by respectable Chief Guest, Mr. Amit Arora and then by Guest of honor, Mr. Rajesh Kumar. 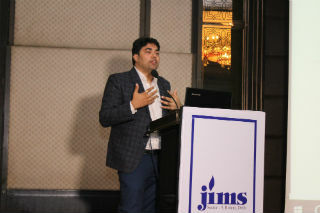 Mr. Amit Arora, Partner, Foresight Gr. International began his speech by setting the atmosphere into a frenzy mode and discussed Existing and emerging technologies in IT world. He further introduced few newer technologies and the future of those technologies. He further highlighted the need for an effective utilization of data and that in the IT industry. He motivated students with his words of wisdom. Mr. Rajesh Kumar, Chief consultant & Founder, Alleviate IT consultancy started his speech in a very interactive manner and discussed about IOT . He discussed further the IOT challenges, security and blockchain concepts. 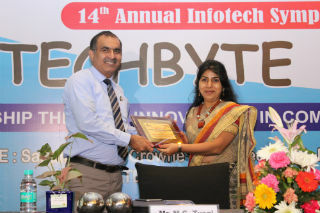 The inaugural session was concluded by release of INSIGHT 2017 and presenting mementos to the guests followed by vote of thanks by Ms. Suman Madan, Convenor-TECHBYTE 2017. 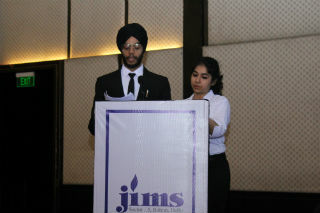 The First Technical Session was instigated by Mr. M. C. Tyagi. He discussed about IOT sensors and interconnecting devices using various applications of IOT. He discussed Challenges of IOT and Stressed out that implementation of IoT in an organization is not an easy job and it involves many challenges as you go along from idea to product. The session was then taken over by Mr Rohit Sahni, Technical Program Manager, NSIG- UIA project(GOI) and he discussed “Bigdata & data masking in bigdata environment” with students. 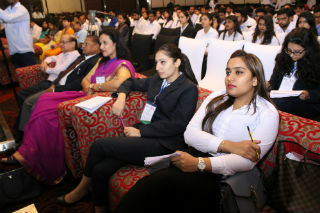 Various career opportunities in big data analytics were highlighted. He explained big data concept, its challenges, tools and Data Analytics life cycle and data masking in detail. The discussion that took place was very valuable for the students to understand basics of all these two experts. 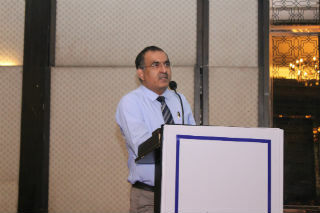 The Second Technical Session was commenced by Mr. Kishore Garg, Solutions Architect, Quovantis Technologies. He nourished the audience about Machine Learning knowledge. He shared his views and knowledge on clustering and regression techniques associated with machine learning. He also discussed popular algorithms associated with machine learning also. Next technical speaker was Mr. Anjani Kr. Thakur, Team Lead, Accenture Services Ltd. He spoke on the topic “Robotics in AI” and discussed robotic components and programming languages used in robotics. He emphasized the need of emotions in robotics. It was yet another wonderful session and equally useful for students. 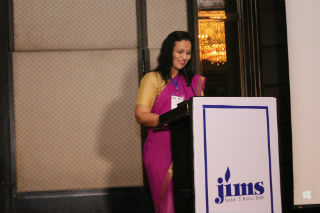 The second technical session was concluded by Ms.Komalavalli presenting vote of thanks to all speakers from IT industry. 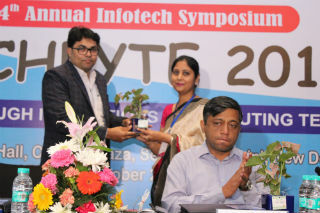 The symposium was coordinated by Ms. Suman Madan along with IT faculty team. 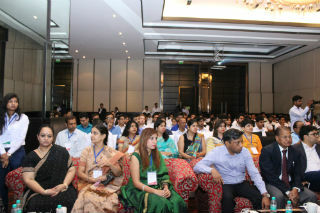 The audience took great interest in the event and enhanced their knowledge about upcoming IT fields. The symposium was a huge success.